TUCSON WEEKLY : RAUL DIDN'T GET THE NOM. "As that disappointment sinks in, conservationists are partially pinning hopes on the incoming Barack Obama administration and Arizona Gov. Janet Napolitano, a critic of the fence, who is slated to replace Chertoff. But even those hopes were tempered somewhat in December, when Obama passed over Arizona Rep. Raúl Grijalva--an ardent border-fence opponent and sponsor of legislation to repeal REAL ID's waiver provisions--in favor of the more moderate Democratic Sen. Ken Salazar of Colorado to head the U.S. Interior Department. EDITORIAL :WILL THE BORDER WALL STAND? Obama's Southwest Challenge: "Tear It Down"
"The RFID-Zapper is a gadget to deactivate (i.e. 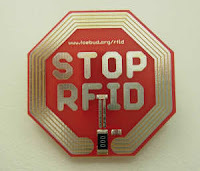 destroy) passive RFID-Tags permanently. Two students turned a disposable camera into a gadget that shocks the life out of RFID tags; now, a privacy advocacy group hopes to sell devices based on their design. Jan. 23, 2006—German privacy advocacy group FoeBuD plans to manufacture and sell a device that consumers could used to disable RFID tags permanently. The gadget—called the RFID-Zapper—was developed by two students in Berlin, Germany. FoeBuD says it wants to manufacture the RFID-Zapper and sell it at its online store. The group met with a hardware developer last week, but says it has no timescale for production or product price yet. One of the disposable cameras the team used to make its RFID-Zapper. The creative minds behind the RFID-Zapper belong to Tim and Chris (the pair would not divulge their last names), also known, respectively, as MiniMe and Mahajivana. The young inventors say their motivation was concern over the potential use of RFID tags on individual items purchased by consumers. "We read a lot about RFID and its future use and got worried," says Mahajivana. "Some easy way of getting rid of them had to be found. Frying them in the microwave oven wouldn't be an adequate solution most of the time, as it could damage the already-purchased item the tag was attached to. But causing the chip to burn through somehow seemed to be a good idea." The duo's prototype uses the casing and electronics of a single-use camera with a flash. Within the next few weeks, the duo claims they will post online instructions explaining how others can build a copy of their tag killer for their own use. "Whoever wants to build an RFID-Zapper is welcome to do so, as long as he's not making any profit with it," says Mahajivana. The design replaces the camera's built-in flash with a coil of coated copper wire. The inventors removed the film and, after disconnecting the camera's capacitor from the flash, soldered one end of the coil to the capacitor and the other end to one pole of a switch used to turn the device on or off. They then connected the switch's remaining pole to the capacitor's other terminal. Once the camera is reassembled and held very close to an RFID tag, the duo explains, pressing its shutter button causes the coil to emit an electromagnetic pulse that will overload the tag's circuitry and destroy its ability to function. After zapping several tags, MiniMe and Mahajivana used an RFID-Tag-Finder to test them for signs of life. "It finds passive RFID tags operating at 13.56 MHz, which are the ones we can zap," explains Mahajivana. The inventors built the RFID-Tag-Finder based on details published in an article appearing on the Web site of C'T, a technology magazine. The students first posted their own article about the project on Dec. 27 on the Public Wiki Web site. The site was developed for the 22nd annual Chaos Communication Congress (22C3), a four-day conference organized by the Chaos Computer Club (CCC), which bills itself as Europe's largest hacker group. Since then, the two developers say, their posted article has had 35,000 hits. On the Web site, RFID-Zapper's inventors note that users of their creation should exercise some caution: "Modifying a single-use-camera into an RFID-Zapper isn't completely free of risks," they warn. "If the capacitor is still charged fully or partly, you might catch yourself an electric shock. We also recommend against using the RFID-Zapper on RFID-Tags found within electrical devices, for these are likely to suffer damage, as well. You also shouldn't use RFID-Zappers too near to electric devices, especially if they are expensive. You also shouldn't use it near any magnetic data storage, like floppy disc, MCs, hard discs, credit cards, streamer-cartridges and so on. And don't try it near your grandpa's pacemaker or other sensitive medical equipment either!" In the future, the developers say they have ideas about adding other functions to the RFID-Zapper. "For quite some time, I've been thinking about some further use of the concept. A combination of a tag-finder and a tag zapper would be cool, as it would be a design that would allow small mass production," says Mahajivana. Given the close proximity to the tag required for the RFID-Zapper to work, a tag finder would help determine the location of an RFID tag to zap. Although the RFID-Zapper's design is complete, the duo says they have thus far been able to test their zapper only on 13.56 MHz tags, as those have been the only kind they have had access to. They say they would welcome the chance to test their device on tags operating at other frequencies, however, and have asked visitors to the RFID-Zapper Web site to provide the team with such tags. That is one way to describe anyone who has observed the annual death counts of those who chose the treacherous treck across Arizona's deserts and expired due to dehydration and exhaustion. The ones who made it through only to endure human trafficking Coyotes- criminal people enslaving those seeking a better life far from Mexicos destitution- often meet unfortunate ends, no better off for their sacrifices. Are lives and living illegal? The contingencies of immigration reform are enough to make anyone hang their heads and weep. In the past, Janet Napolitano has sided with her constituents as a leader on immigration and come out the other side alive politically. Janet Napolitano has her critics and her supporters, but she has accepted a tough position where she has to enforce excruciatingly difficult policy. The Secretary of Homeland Security has been an inherently unlikable and unpopular office. Unfortunately, after being responsible for excessive force set against civil liberties, illegal wiretapping, and TSA giving fliers en transit the stink eye for 8$ an hour; they've earned it. On many occasions, I have said that whomever is in that seat is going to end up being "the bad guy". However, for the first time in history immigration reform might actually get some badly needed attention. For those desperate for closure, any decision would be better than the procrastination of indecisive, panicky officials seeking re-election. Appointed officials can do things that elected ones cannot for fear of alienating contributors and voters. Many are holding fast to hope of extracting emergency management and federal immigration enforcement. The two being squashed together in the same agency has brought an unnecessary tone of mass hysteria. To the relief of many, FEMA may be walking away from a marriage from DHS so that the wasteful and unreasonable elements of current enforcement can be dealt with. People are tapping their watches, shifting from foot-to-foot: it's time. For the sake of a New Year, flowers for Janet Napolitano might look like the space to do her job differently from predecessor, Michael Chertoff. 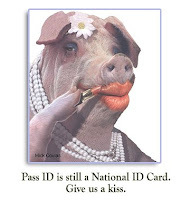 When it comes to Real ID, the legislation has been found out and is dying from exposure to American outrage. Those who are endeared to it's design and benefits are very few in number. It can only survive like a creeping vine, growing in secrecy, underneath the knowledge and consent of the people. S.717 is Real ID up for re-election. It's Real ID remixed for a new administration. It's the same garbage in a new white suit. It's time the people communicate with our leaders: don't get attached to Real ID, it's on its way out. Until then, we stick to our original plan, standing on the 10th Amendment - state's rights to a sovereign governance and passing on the volunteer offer to move ahead with Real ID for individual states. Has anyone seen special effects in science fiction films or video games where a huge boss-monster is exploded into parts and then the parts regain their life and keep moving around, wreaking havoc? Enhanced Driver's Licenses meant for "alien migrant workers"
And now, The Tribal ID Card , U.S. leaders gotta get the Native American government compliant with the rest of the Western Hemisphere Travel Initiative (WHTI) Program. CLUE: WHTI's modus operandi is to get everyone on some sort of quantifiable electronic grid system. Now - between you and me and the mosquito on the wall, I really don't think most Native American's are too essentially hip to the electronic grid system as part of the res. Casino Natives now empowered by independent wealth are more like Libertarians in that they want LESS governing intrusion from the "white folks". They do not envy urbanites like you may think they do. So this brings us back to square one. Who are the people who want us on the electronic grid system? Well... you may start with the Council on Foreign Relations and count backwards until you arrive at the United States birthplace conclusion: socialism run by a select few elites doesn't work in America. No matter how bad they want it. The Natives are really sensitive to how this all works. We should get out of their way and leave them alone. I think we've honestly done enough. They don't need a special card from the United States government to tell us who they are. I think they're going to tell the U.S. government what to do with their ID cards, not the other way around. OOOOOOOKLAHOMA ... Beating the Chip? We Think So. 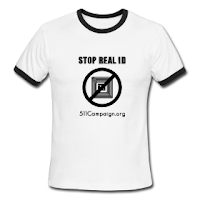 RUMOUR HAS IT ...Oklahoma is hard at work with partners Constitutional Alliance in stopping Real ID. No recent bill activity is confirmed yet. However you can check for details on Axxiom's (a.k.a. Kaye Beach) newest blog to track back Real ID for her state. She covers a host of other issues and is one of Freeople.com's hotshot bloggers. AUSTIN - LEGEerazzi are roundabout hounding 5-11 Campaign members for details on their bill. A bill so secretive that very few committee members had the courage to appear for the final vote. Committee members may have lost their motivation due a requirement to sign a non-disclosure agreement in order to cast final amendments votes to their bill draft. Campaign leaders are being asked for details on the bill, but have explained to national talk show hosts that information is limited. "Sorry, no comment - I signed an NDA, " said Sheila Dean, the recently elected President of the 5-11 Campaign. Maryland's Governor met with Team Obama about prioritzing Real ID in the space of a crapshoot economy where the odds of losing are greater the more we invest in unfunded mandates. It goes something to the tune of indicating citizenship on a license. (AHEM- YOUR PAPERS, PLEASE?) Citizens get painted by the same brush as "illegals". Press affiliates have their palms up, titling editorials like, "Real ID doesn't have to be like Big Brother".